Tiffany May, KK, and John Ochoa pose for a photo. Photos courtesy of Chloe Ham. 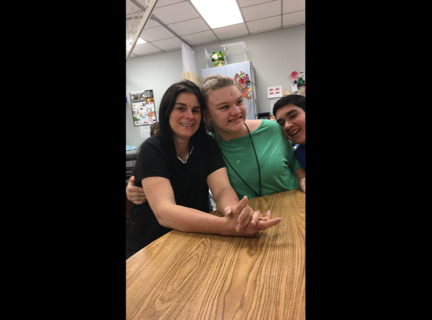 Special education teacher, Staci Tucker spends her days caring for the special needs students here at K-Park. Her days are filled with keeping a watchful eye on her students and being constantly prepared for any possible scenario, whether a student chokes or starts to seize; she’s prepared. Tucker has worked at K-Park for the last eight years, working mainly with the lower functioning students. “Well the one major way our day differs from that of regular ed. teachers is that we have to maintain at least one set of adult eyes on our students at all times,” Tucker said. Heavily decorated and smelling like home baked goods, the special education room is one that relaxes and provides comfort forthose who learn inside it. While everyone knows about the special education program, not much is known about what happens inside the classroom. The students spend their time learning to bake, cook, and use household appliances. They also work on writing numbers and letters. K-Park has an excellent Best Buddies program. Special education students get paired with regular education students and they go out and do things together like go to the movies or go bowling. The club gives the special ed students the chance to do things that they wouldn’t have been able to do before. It gives them the chance to be a normal teenager, and not be held back by their disabilities. K-Park also has a peer tutoring program that takes place during school. Senior Chloe Ham, spends her fifth period in thespecial education room, where she helps out. She helps the students with reading and writing among other things. Some days they have fun and they make cupcakes or watch movies. Other days they read books and do worksheets or conduct simple science experiments. “My favorite thing is getting to work with amazing kids and getting to see their smiles grow,” Ham said.